Spokane Police officers on a downtown emphasis patrol last summer. This week we have a story about the work of a city task force charged with tackling downtown's issues — perceived or real. Last summer, this issue exploded after businesses complained about groups of teenagers loitering outside their doors and KXLY captured video of a group of young people assaulting a man outside the Satellite Diner. Earlier this year, a teenager assaulted a man outside the Steam Plant. We met some of the young people downtown and wrote about these issues last year here. As this discussion resurfaces this year, it's important to note, as it was last summer, that crime statistics show that violent crime is not increasing in downtown. As you can see in the Spokane Police Department's data here (scroll to page 33 for downtown), violent crime downtown is down 15 percent since this time last year. In mid-August of last year, violent crime downtown was down 8 percent from the previous year. That means the real issue here is the perception of downtown as an unsafe or undesirable place. And that's what the Mayor's Task Force on Urban Environment is really working on. They've outlined a plan (read it at the bottom of this post) for the short and long term that includes increased police presence and increased services to homeless people in downtown. They're calling it a "push-pull" approach. "Push" by enforcing laws against so-called "quality-of-life crimes" like panhandling, sitting and lying on sidewalks and smoking near building entrances. "Pull" by offering services to people on the street. 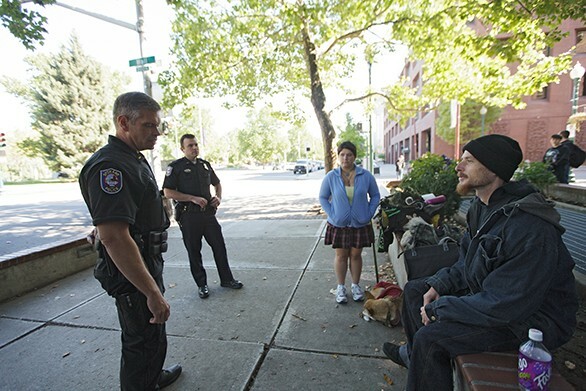 The city is offering a temporary grant for street outreach directed at young people, but much of the "pull" work still remains unfunded, including housing for young adults and permanent housing for the chronically homeless that is "low barrier," meaning it doesn't require strict rules like abstinence from alcohol and other substances to live there. (Learn more about this approach and its use in Seattle here.) The task force will now begin asking for funding for such projects, including from businesses in downtown. The task force includes people representing downtown businesses, police and service providers, and they all say the goal isn't to push anyone out of downtown to make it better for anyone else. Instead, they say they're trying to make it a "place for everyone." Whether that works remains to be seen. But, in the meantime, the group's work has given us the city's first statistical look at what people downtown — both those in the business community and those sleeping in shelters or on the street — want and need. Which issues downtown businesses identified as most important, based on a survey done earlier this year. 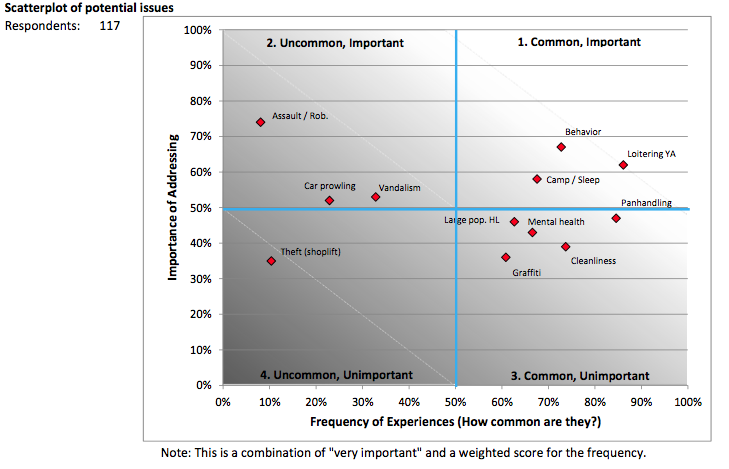 You can see the full survey results for yourself at the bottom of this post, but the issues business owners identified as "common and important" were mostly those nonviolent nuisance issues like loitering and "obnoxious behavior." Assaults and vandalism were also considered important, but not common. The homeless adults and youths/young adults were asked about their reasons for homelessness and their needs. Overwhelmingly, employment and housing were major needs. Bridget Cannon, who oversees youth programs for Crosswalk, the shelter for teens downtown, says the results weren't necessarily things service providers didn't already know about downtown. But funders want numbers. "When people want to put money into something they don't want anecdotes, they want the data," she says. "This was a really good way of legitimatizing what we knew through our anecdotal experience and talking to the kids." And that means more hope for funding for things like housing, job and internship programs and mental health care — the things that service providers say will make the real, long-term difference for downtown.